The free will argument is the one most of us believe. I mean, suppose I want to raise my right hand. I can do it or not, right? I could stand up right now and yell “hippopotamus.” Or buy that new car –yeah, the red one… convertible… These are all choices where we consider the various possibilities and pick the outcome we want, right? The simplest form of the free will position ( lovingly referred to as naive free will) says we are completely the masters of our destiny– all of our responses to life’s stimuli are conscious choices we make. An old proponent of this was John Locke ( of life, liberty and property fame) who said when we are born we are all “blank slates” that we then write our future on them. But, argue the determinism folks, (and this one starts to sound like the old silent tree falling in the forest stuff) suppose every thought and action you take IS determined and predestined? So where does this whacky determinism idea come from? Are these guys smoking old gym socks? Hang in there and you’ll see that they have a point. What’s more, as science (oops the “s” word again) advances, the determinists are gaining more and more ground. You see, science is really into this “cause and effect” thing. A billiard ball (and all science comes down to the study of billiard balls) –anyway, a billiard ball doesn’t decide to just roll across the table on it’s own volition. It has to be hit with another billiard ball to initiate the trip. And since we’re all made of of tiny billiard balls — we call them atoms– each of the atoms can’t move without a prior cause. Some other atom has to give it a smack to get it going. So chemicals– bunches of atoms– can’t react without a prior reaction to get them going. This keeps growing until leaves falling, winds blowing the sun shining, etc. are all predetermined from the beginning of time by the first reaction that happened. Anyway, so far, free will rules! I mean in the law, art, human relationships, religion we all depend on our ability to be in control of — and responsible for — our own actions. How can you blame someone if what they did was determined by two atoms making out at the dawn of time? But slowly determinism is creeping up on us. Already we are finding that your personality and your reaction to other people can be caused — determined — by the chemical balances in your brain. So think about it… As if you had a choice! Anyway, back to the real subject. It turns out the Tarot Deck is a wonderful example of determinism! You buy a brand new deck and take it out of the box and guess what? Every deal that you deal thereafter is completely determined by how you handle the cards! you shuffle them three times, cut the deck and deal. The order in which the cards appear is completely caused by your shuffles and cut. Then you scoop up all the cards and put them away in the box, in an order determined by how you scoop them up. Later you shuffle and deal. This next deal is controlled by the first shuffle and deal that you made as well as the second one. This goes on as long as you use the deck. Each Tarot spread you deal is determined by all the previous Tarot spreads you have dealt. Spooky, huh? I think that is why we should treat our Tarot cards with a touch of reverence. Not because they’re magic or anything, but because the deck at any moment includes all the past history that the deck has been through. Every shuffle, every reading, even that time you dropped the deck and all the cards spilled all over the floor — every action you take with your Tarot deck will determine the order in which the next deal appears. When you combine this deck “personality” with the miraculous number of possible Tarot Spreads you discover that each reading is a unique rare gift that is delivered to you through all the past experiences of the Tarot enthusiasts that have enjoyed using that deck. 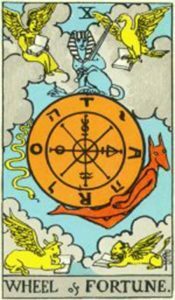 Your reading is the sum of the deck’s past experiences with your friends, family and acquaintances. Their shuffles, cuts and deals determine how the cards will appear in your reading. So your insight is the end product of the insight of those who went before you, predetermined by each turn of a card. Previous PostThe Amazing Math of the Celtic Cross!Next PostIn Astrology Does the Distance of the Planets Matter?